Yes, the form factor is small, and quite nice. And the optional side handle helps bridge the gap between those who are moving from DSLR shooting into a true cinema system. However, the rounded body still feels like a camcorder and not a digital cinema camera – (maybe its the inclusion of that view finder on the back as well). Its irregular shape and lack of mounting points don’t make it easy to build out and customize your rig. A baseplate on the bottom can provide Rod support, and the shoe mount on the top gives you another mounting option, but on the whole, the camera body is not designed for a full build-out. Maybe this was a smart move by Canon – focusing all of their design on form factor and the sensor specs within, and allowing third parties to design modules that build around the technology and help integrate it into traditional cinema camera setups. This is where Redrock Micro steps in with their new ultraCage, which they have designed in tandem with Canon. The cage provides full baseplate support with a 15mm rod system, and is rock solid. It has two places to screw into the base of your camera – with a 3/8"-16 and 1/4"-20 screw holes on the bottom, and another 14"-20 on the top. There are also rod mounts on top and bottom of the cage, without sacrificing the use of a top handle (always helpful in run n’ gun situations, or just moving your heavy rig around on set). However, the cage is also built to be the correct height for 19mm rod support and cine lens use if you just mount the cage to a 19mm baseplate. This came in handy on "Mobius" because we were working with Canon’s new cinema zooms almost exclusively. The cage wraps 360 degrees around the camera body and doesn’t block any of the cameras buttons or features – including the side handle should you put to keep it on. Throughout production on "Mobius" however, we hoped to remove the handle as it got in the way of other accessories. It is also filled with numerous mounting threads both (3/8"-16 and 1/4"-20). You have to love this – because this is what gives you the power to customize your rig so that it is comfortable to the way you shoot. I typically mount an EVF, or Marshall Monitor on an arm to the cage for monitoring. Also available are optional add ons, including an extension element that mounts to the back end of the rods and extends the cage behind the camera. This gives you a whole other surface of mounting threads, as well as a place to mount the optional backPack, which can carry an external battery (such as the Anton Bauer Dionic 90s). Which brings me to my next point – a powered cage. I have been using a powered cage with my DSLR rigs for years. 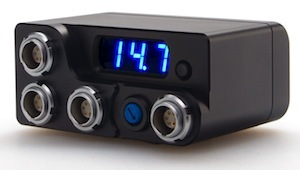 Simplifying your rig by running everything off of one, reliable power source, is incredibly helpful. While the batteries can add weight to your rig, they also minimize the points of power failure. This is why it is extremely exciting that the ultraCage comes with an optional powerPack, that can take the power from the battery mounted to the back of the rig, and distribute to your camera and accessories via three outputs. There is one variable output (5-12v), which is typically used to power your camera (the C300 is 8.4v), and two 12v output ports used for power accessories (such as an EVF or Monitor). Of course, if you can’t front the $15,999.99 price tag on the C300 – but still want the use of a professional, powered support system for your DSLR rig, Redrock has developed a universal version of their ultraCage as well that works with all DSLR’s, as well as the Sony FS100 and Panasonic AF100 which makes this an even more attractive solution for all types of shooters with a wider range of budgets. You seriously make me so jealous with all the awesome gear you have. I cry whenever you post a new blog. Couldn’t help but notice that the 16-35 had a costarring role in the behind the scenes piece. That lens seems to make a whole lot of sense with this camera… but can you tell your pals at Canon that something between the 1k 17-55 and 30k 14.5-60 would be appreciated? Which screen/monitor are you looking @ 1.18 ? do you use sdi there? I’m confused, the key pro mini mounted behind the canon is more for show right? Because I have one and as far as I know it does not work with the slr’s. Right? Anyone want to guess what Canon would charge if they made and sold these accessories? We’re better off with smaller vendors that work closely with users, are flexible and have lower costs. I have a question regarding FCP X and thought you might have some further insight or resources. This question is unrelated to this particular post, but thought my inquiry would have a greater chance of being seen; it is slightly relevant regarding the Canon C300. If this is true, do you know or would you know anyone that would know what software and workflow Apple is referring to? I have not been able to find a solution. I know there is a plugin for FCP 7, but it doesn’t seem to do anything in FCP X. Any advice and assistance would be greatly appreciated. Seems to be a great cage that complements the camera perfectly, but what about price and availability? Back in the day I could open the case and either mount an Eclair NPR on a fluid haed, or put it on my shoulder and shoot. Same thing with an Arri 35 BL, Aaton, etc. NO CAGE necessary. Instead of copying Pro cameras, Canon seems to have copied Bolex. Would it have been too hard to put the finder up front like a Pro camera??? 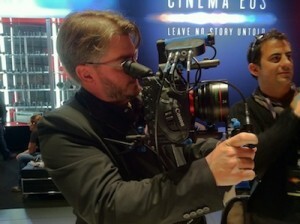 I’ve seen a C300 with a Zacuto EVF next to the lens, and the body on the operators shoulder. This isn’t just a Canon problem. Sony, who knows better, has screwed-up the ergonomics on the FS100 and F3. Any insights on when the universal version might be available? No but I’ll ask RedRock to comment here. I assume Redrock is showing the Ki pro mini bc that seems to be what the industry favors. I’ve seen it on the F3, cs300, and im sure now the 2 nikons can benefit from it as well. Like to say, thanks Vincent, great blog! Big inspiration, great information. 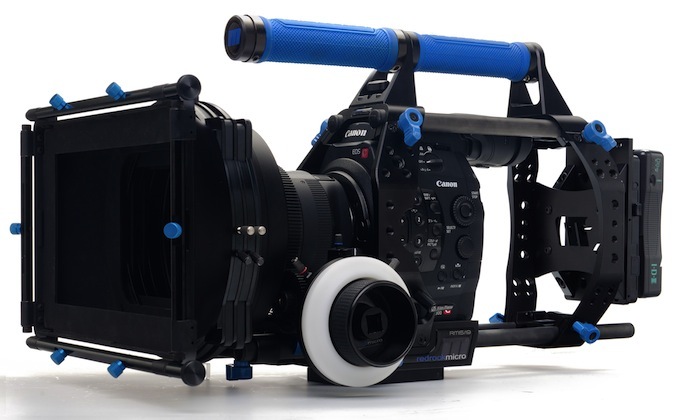 Any news on the new Ultra Cage Blue for DSLR, I just got a Canon 5KMIII and trying to configure the best set up? 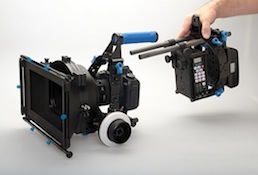 My cart has the follow focus, universal cage blue for DSLR, shoulder mount, and matte box?? thoughts? No news on my end sorry. I’ve only worked w/ the cage w/ the C300. @Vincent Laforet, thanks Vincent! I’ll let you know how it performs.